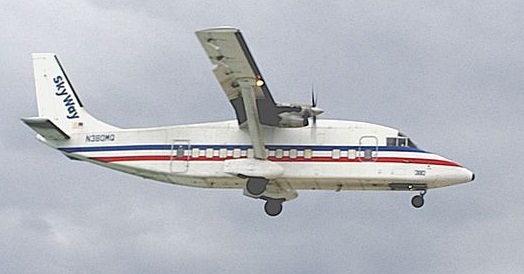 On 29 October 2014, Shorts 360 N380MQ, operated by SkyWay Enterprises as a Part 135 flight on contract to FedEx, crashed into the sea, shortly after a night time take-off from Sint Maarten in the Caribbean. The aircraft, which was was on a regular cargo flight to San Juan, Puerto Rico, was found on the sea bed 0.8 miles from the Princess Juliana International Airport, Sint Maarten (SXM). The two pilots, the only occupants, were both killed. The Captain observed the cargo loading and provided a cargo manifest to the ramp agent. A repetitive company flight plan was on file. The flight commenced taxi to runway 28 at 1828L [and] was cleared for take-off at 1838L. At 1840L Tower personnel observed a normal take-off and initial climb. Then Tower personnel reported, [that upon] passing the departure end of the runway, the aircraft began descending both visually and on radar. There was no response to calls from the Tower…and the ATC data block for the flight no longer appeared on the airport radar screen. The first Coast Guard vessel was dispatched at 1900L. The sea and air search in the immediate hours of the crash confirmed aircraft debris in the area but there was no evidence of any flotation devices or survival equipment on the sea surface. The submerged wreckage was later located by divers. A handheld GPS device was later recovered from submerged wreckage. …recorded data indicated the aircraft past the departure runway threshold on take-off and attained a maximum GPS altitude of 433 feet at 119 knots groundspeed at 18:39:30L. The two remaining GPS data points were over the sea and recorded decreasing altitude and increasing airspeed. A modification had been approved in 2005 that added an external antenna for this carry on GPS device. SkyWay Enterprises (SWE) was originally issued an FAA Air Carrier Certificate in 1979. They primarily operated cargo services within the Caribbean. When queried during the investigation both the DO [Director of Operations, who was also the company President] and the CP [Chief Pilot] stated that they had not been informed of any specific safety concerns nor had they seen the need to conduct safety meetings or distribute further information dedicated to safety issues. Management did not provide any method to communicate safety issues with the employees through internal company media (email or bulletin) or to maintain a voluntary safety reporting system. The DO stated he was, “always concerned about safety with the pilots and airplanes, it’s an ongoing thing”. The aircraft was towed to ramp. The Captain [had] reported to the DM [Director of Maintenance] that during runway rollout, he experienced, “no steering, no brakes and no reverse”. The DM directed some trouble shooting and an engine run. In a telephone conversation, the Captain reported that he was showing a “no brakes” indication on the panel. The DM directed a check of the emergency brake handle for proper position. The handle was not all the way in – and pushing the handle all the way in corrected the “no brakes” condition. The Captain attributed the anomaly to a “bubble” in the system. The DM dispatched a SWE maintenance engineer to examine the aircraft. The engineer serviced the hydraulic system in accordance with the maintenance manual and declared the aircraft fit for return to normal operations. The crew then flew the aircraft, with the maintenance engineer on board, back to San Juan as a normal scheduled flight. No further contemporaneous safety action is mentioned. Discussion of the incident among colleagues of the accident Captain and others revealed that after landing that day, the Captain shut off the fuel levers accidentally. The DO further explained his view of the incident in a letter to investigators: “Part of the after landing checks are to reduce the fuel lever from flight condition to ground followed by bringing the propellers from high RPM to ground. This helps slow the aircraft and reduce engine power on the ground. If the fuel condition levers are pulled too far aft of the detent, the fuel supply to the engines will be cut off shutting down the engines”. The DO described the CRM training mandated by CFR 135.330 as “one on one”, a discussion about accidents, procedures, “who does what”, and challenges/responses. He mentioned a good portion of the training was on CD and video. A variety of industry sources [e.g. Flight Safety Foundation ALAR Tool Kit Briefing Note 2.2, UK CAA Standards Document 29, et al] indicate an effective CRM program encompasses a wide range of technical knowledge, airmanship skills, interpersonal communications ability, situational awareness, problem solving, decision making and teamwork; working together to make optimum use of all available resources. The investigation believes that the short explanation by the DO is a strong indication that the eight required elements of an effective CRM program were not presented in sufficient detail to be effective. Also telling is that the operator chose not to participate as a party to the investigation. SWE has a traditional approach toward minimum compliance with regulations and resistance to change. Training of the next generation of young pilots and maintenance engineers is seriously challenged in this environment. It can be a breeding ground for the learning of bad habits. The investigators make no comment on the supplier selection criteria, contractual safety requirements or safety assurance oversight of their supplier (if any) by FedEx. Oversight of the operator was conducted by the FAA Orlando Flight Standards District Office (FSDO). At the time of the accident the Principal Operations Inspector (POI) for SWE had been in his position for 3 years. He was not type rated in the SD3-60. He was responsible in the FAA work program for oversight of 15 Part 135 carriers. He characterized his workload as “intense”. The lack of time devoted to the companies regulated also featured in this accident: NTSB Reveal Lax Maintenance Standards in Honolulu Helicopter Accident. As the FAA considered SWE to be “low risk” before this accident, it was seen as a lower priority for oversight. He was aware of the content outline of the CRM training required by FAR 135.330. He had not observed nor was he required to observe the actual training course. He did not perform en route cockpit line evaluations of SWE aircrews. He was not aware of GPS use in the cockpit. He had observed some SWE ground school however it was not in his purview to observe Flight Safety training in New York. That responsibility was assigned to a dedicated FSO. During an interview, the former PMI (2010–2012) described his relationship with the DM and DO as “difficult”. He related that any proposal brought up to the company management was challenged with “tell me why”, or “show me the regulation”. He expressed that SWE often “dragged their feet” and in his opinion more work was needed by SWE management to produce an acceptable General Operations Manual (GOM). A particular focus of disagreement centered around the engine TEMP program with an extraordinary unlimited on-condition TBO [Time Between Overhaul]. On previous SD3-30 aircraft with PWC PT6A-45 engines, the overhaul schedule was considered to be unlimited and only on-condition. [It] was the subject of correspondence between the FAA and SWE. The issue was resolved with a revised Ops Spec D101 that authorized the use of on-condition engines until a TBO of 12,000 hours. The current PMI (2012-present) stated in an interview that the relationship with SWE management was normal and typical. The were no findings on his last oversight visit in May 2014. He indicated he was aware of the engine TBO issue and could turn to the FAA Engine Directorate if more assistance was needed. He was aware of the latest revision of PWC Service Bulletin No.13003R8 for TBO time extensions but stated there is no requirement for SWE to incorporate SBs in the TEMP. He [also] stated that SWE was not required to maintain mechanic training records. An FAA Headquarters Air Safety Investigator participated in the powerplant investigation… His observations of overall poor engine condition resulted in action to rescind the SWE Ops Specs TBO of 12,000 hours and to set limitations in accord with the current PWC SB (6,000 hours). At the FSDO level, the emphasis is on giving check rides and observing check airman rather than en route inspections. On the subject of voluntary safety reporting programs and SMS, the manager emphasized that all subordinate staff inspectors were well versed on SMS. They have an FAA Safety Team (FAAST) to assist with the Part 135 program. However, when asked for specifics, particularly regarding SWE, the response emphasized that these programs are voluntary, “I guess that would go perhaps to the culture of the company that would encourage that. And that is as individual as every company is”. 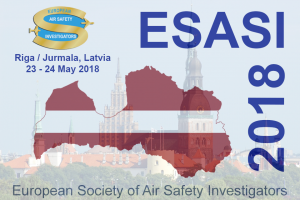 Indeed, as Aerossurance’s Andy Evans observed 10 years ago in the FSF‘s AeroSafety World, if an organisation would only implement an SMS because it is a regulatory requirement, then it probably has a weak safety culture. While Part 5 made an SMS mandatory for US Part 121 operators, this did not extend to Part 135 operators (as discussed in our article: US Part 5 SMS Progress). This limited FAA approach to SMS regulation has created what the investigators call a “two tier system” and note that “all ICAO member states are obligated to establish national legislation for their international commercial air transport operators to establish an SMS”. There is therefore no exemption in ICAO Standards and Recommended Practices (SARPS) for the FAA to exempt non-Part 121 commercial air transport operators, even if they could for domestic operators. …particularly concerned with the typical next generation of aircrew who will move upward in the commercial air carrier world. The Part 135 operations provide the experience platform for the great majority of next generation airline pilots and on-demand air charter crew members. [and] the same can be said for the engineering staff supporting these operations. They will learn both the good and the bad of aeronautical decision making from this Part 135 operational experience. Their attitudes toward safety awareness and analysis of risk will be formed on every flight as these commuter, charter and air cargo pilots gain the experience to move up to more sophisticated equipment and added responsibility of larger scale passenger operations. The SMCAA have therefore grasped that poor operational standards can be a wider industry cultural issue. Operations at SXM throughout the year favor runway 10 over 90% of the operating hours. Night departures from runway 10 overfly an illuminated area during initial climb out. On the night of the accident, the wind was from 230 degrees, 10 knots, gusting to 20 knots and direction variable from 220 to 270 degrees. The airport was operating for take-offs on both runway 28 and 10; night landings, runway 10 only. The investigation believes that take-off direction on runway 28 toward the open sea was relatively unfamiliar to the both the PF [Pilot Flying] and the PM [Pilot Monitoring]. A lack of visual references after passing over a shoreline at night is described by many pilots as a “black hole” effect. Although the possibility of thunderstorms and wind shear were forecast in the area, no severe weather was detected or reported by airport workers or search teams within the time frame of the accident. However, darkness, rain, and wind gusts were present during the accident scenario. These environmental conditions are cause related because they presented a loss of visual references after liftoff. The PF was required to transition from visual conditions to primary flight instrument references and to use attitude instrument flying skills. Facts indicate the aircraft was observed to take-off and attain a normal initial climb. Then a major deviation from the climb out profile occurred and the aircraft started to descend and disappeared from visual and radar view. The investigation could not confirm with certainty which crew member was the PF. However, both crew members had sufficient total flight hour experience and multi-crew flight hours operating the SD3-60 to be competent in their respective pilot flying and pilot monitoring duties. The cockpit authority gradient was notable and may have affected crew performance: Captain versus First officer – 5318/1049 total flight hours; the age difference – 49 /29 years; the PIC time 3618/275 hours. Peer comments indicated the two persons were comfortable with their crew pairing. Lacking CVR conversation, the investigation had no evidence upon which to make a determination on the Captain’s attitude toward teamwork or the possible inadequate assertiveness of the First Officer in the performance of pilot not flying/pilot monitoring duties. Wreckage inspection revealed the landing gear was retracted and the flaps were most probably retracted to UP. As the GPS data indicated that aircraft attained a maximum height of about 400 feet and 119 knots groundspeed, allowing for a 10 knot headwind, the accident aircraft was approaching 130 KIAS airspeed. Operations procedures in the SWE Training Manual prescribe a schedule for flap retraction; accelerating thru 120 KIAS, Flaps – 5, and accelerating thru 125 KIAS, Flaps – UP. The longitudinal acceleration at this point provided an apparent pitch up moment (g force). Susceptibility varies between persons and circumstances as to the magnitude of misperception. In this case, external visual cues were nonexistent [due to black hole effect]. The start of a left bank combined with g effect is considered sufficient to be misinterpreted as a sensation of pitch up leading to a somatogravic illusion. Somatogravic Illusion definition: At night or in IMC, lacking visual clues, rapid acceleration in flight generates a strong “tilt back” sensation which the pilot interprets (incorrectly) as a pitch up, despite the fact that the aircraft may still be on the intended flight path. To correct this imagined excess climb, the pilot will push the control column forward in an attempt to return to a normal flight path. Lowering the nose can result in a rapid descent. Loss of situational awareness may have had an early effect on crew performance. The investigation believes the presence of an unfamiliar runway in a night and rain environment provided a basis for high stress. The obligation to comply with ATC instructions to turn left to 230 degrees after take-off, and commanded flap retraction with associated acceleration, combined to set in motion a somatogravic illusion for the PF. The PF’s unintended mishandling of the flight controls and a desire to pitch down while initiating a left turn quickly led to an extreme unusual attitude and the subsequent crash. Early recognition of divergence from the intended flight path (situational awareness) is a necessary component of the CRM concept. The investigators were sceptical about SWE’s CRM training (see above). 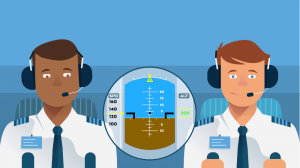 Pilot monitoring and effective crew coordination are key factors toward prevention of an aircraft upset and recovery from a loss of control situation. Much is unknown in this accident scenario because conventional on-board recording devices were not available [as SWE had removed the originally fitted equipment - discussed above]. However, results indicate the obvious [sic], CRM and actions to recover from the unusual attitude before it progressed into full loss of control were insufficient to avoid the crash. The investigation believes the PF experienced a loss of control while initiating a turn to the required departure heading after take-off. Flap retraction and its associated acceleration combined to set in motion a somatogravic illusion for the PF. The PF’s reaction to pitch down while initiating a turn led to an extreme unusual attitude and the subsequent crash. PM awareness to the imminent loss of control and any attempt to intervene could not be determined. Crew resource management (CRM) performance was insufficient to avoid the crash. The Sint Maarten CAA recommends the US FAA evaluate the facts, analysis and conclusions contained in the Final Report of this loss of control accident (N380MQ) and of similar recorded cases of CRM (cockpit resource management) breakdown during a loss of control. Following this evaluation and collection of detailed data from additional known sources, the Sint Maarten CAA recommends the US FAA, within one year, publish a notice of proposed rulemaking (NPRM) to extend the current 14 CFR Part 5 Safety Management Systems (SMS) rule to all Part 135 operators. No such NPRM has yet been published. As we predicted in our 2015 article US Part 5 SMS Progress the failure of the FAA to make an SMS mandatory for Part 135 operators has featured regularly in air accident reports. For example the US National Transportation Safety Board (NTSB) observed the lack of an SMS requirement in Part 135 after HS 125-700A (Hawker 700A) N237WR suffered a LOC-I on approach at Akron, Ohio. NTSB Chairman Christopher Hart commented on the importance of an SMS being: “an effective set of practices, not a binder full of disregarded procedures that sits unused on a shelf”. We have previously written about SMS Shelfware. UPDATE 10 April 2018: The NTSB has issued five new recommendations to the FAA and reiterated eight previously issued recommendations, based upon their investigation of an 2 October 2016 Hageland Aviation Services Cessna 208B Caravan N208SD that impacted mountainous terrain near Togiak, Alaska, killing all 3 on board during a Part 135 flight.